This is a intriguing little book. It goes through things most people probably will never hear about history. For starters I’m a Tampa Bay native so to read about how the grapefruit almost never made it here was very neat. Among other things there’s death by appreciation, trials of various animals, a tax on beards, Niagara falls not falling, how the spark to WWI (murder of Archduke Franz Ferdinand) almost didn’t happen, how the discoverer of laughing gas died, a five cent bill and the one I find the most unfortunate and curious the life and burial of William the Conqueror. There’s lots more I didn’t mention that are most curious so go read it…. A very good history book, nice short read 5 out of 5 stars! It was a good read as a quick little impulse by. Beyond that, not really worth going out of your way for.Some of the events were much more curious than others. Some, I wasn't to sure why they were included. My biggest complaint was that the author, especially in the events from more than a few hundred years ago, seemed to pass on every bit of information on the subject, including pieces that were at times self contradictory and items that the author would even point out probably weren't true. It felt he was unskeptically passing it all along to make the "curious"" events feel even more curious. This book has amazing little-known details from the past.It's very entertaining, and easy reading. Amusing. short. Feels like cheating to count it as a book. This book contains snippets of history; it's not the sort of book I normally enjoy reading, especially in a focused manner, so I've read it over the past 9 months sporadically at work. It was okay. Some stories were interesting and likable. 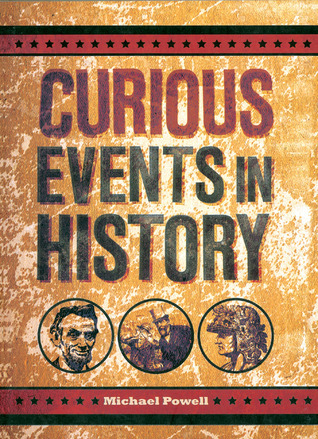 it's a cute book, it actually has a couple of "curious events" that i did not know about, like Lincoln doing coke, etc. A really interesting and funny book to read for those people who like history. It's quite short but juicy. Totally worth it. A quick and interesting read. I just wish the author had included some citations or, at the very least, some sort of "further reading" page. Always love learning new things from history. Some of it I knew, but most of it in this book I found surprising. Great read for history buffs. Fun little book that doesn't shed any great misapprehensions. Just gives a few facts about some, well curious events in history. Can't say much about - there's not much there. I never get tired of the story of William the Conqueror's ill-fated funeral! I truly amsick and twisted. Interesting to read and good for those of us with a short attention span. Very interesting. A few of them I already knew but still over all I enjoyed it. it was an interesting book, some facts were kind of hard to believe but it was good. A fun book about historical facts, I learned some new interesting tidbits. This is a coffee table book which is filled with, as the title suggests, curious events in history.This is not a scholarly work, just a quick read with some interesting stories.It is what it is. EXCELLENT book of historical oddities. Michael Powell - Librarian Note: There is more than one author in the Goodreads database with this name.